Sal (Portuguese for "salt") is an island in Cape Verde. It belongs to the northern group of islands, called Barlavento ("windwards"), and comprises a single administrative division, the municipality of Sal. Its seat is the city of Espargos. The island was discovered on December 3, 1460 and named Llana ("flat"). This name was changed into the current "Sal" when the two large salt ponds (Pedra de Lume and Santa Maria) were discovered. The first three centuries after its discovery, the island was only sparsely inhabited; in 1720 there was a small fishing village near present Palmeira. This changed when the salt industry was developed at the end of the 18th century, starting in Pedra de Lume. Santa Maria was founded in the south of the island in 1830 by Manuel António Martins. During this time the salt industry thrived, with 30,000 tons of salt being exported in the early years. Most of the salt was exported to Brazil until its nationalization in 1887, Portuguese and French salt investors resumed salt production until 1984. In 1939 Italy started constructing an airport to receive flights from Europe and South America. Construction was halted and ceased around World War II. The Portuguese bought the airport from the Italians and finished it in 1949. Northeast of the airport, workers from São Nicolau Island settled in a village named Preguiça, now part of Espargos. Hurricane Fred struck the island of Sal in late summer 2015, causing damage to houses, tourist facilities and ships. The island is 29.7 km long and 11.8 km wide. :25 Its area is 219.8 km2. It is one of the three sandy eastern islands (Sal, Boa Vista and Maio) of the archipelago, with white sandy beaches. The island is fairly flat; its highest point is Monte Grande, at 406 m elevation. :25 The uninhabited islet Ilhéu Rabo de Junco lies near the west coast of Sal. Saline marshes can be found in the Pedra de Lume crater and north of Santa Maria. Sal Island has on average 350 days of sunshine a year. Winds mainly blow from the northeast. However, some days do also have clouds, but they tend to be scattered and seldom bring rain. The 'rainy season' is from July to mid-October, although rainfall is still low. Administratively, the island of Sal is covered by one municipality, Concelho do Sal. 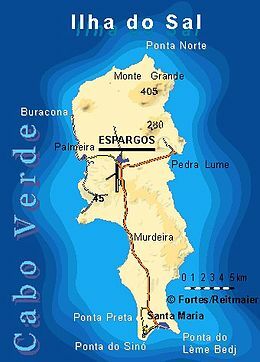 This municipality consists of one freguesia (civil parish), Nossa Senhora das Dores, which also covers the whole island. The municipality of Sal was created in 1935, when it was separated from the Municipality of Boa Vista. The municipal seat was originally at Santa Maria, but Espargos became the municipal seat in the 1970s. Sal’s main town, Espargos, is home to one of the nation’s international airports. Tourism, focused on the area of Santa Maria, has replaced salt and fishing as the main source of income. In 2017, 48.2% of the country's available beds were on the island of Sal. The living standards on the island is among the best in the Cape Verde archipelago. The island's GDP per capita as of 2015 is 495,827 escudos (4,497 euro). Football (soccer) is the chief sports on the island. It has the Sal Regional Football Association and its main competitions are the Premier and the Second Divisions. Its main clubs are Académica do Sal, Académico do Aeroporto, Juventude and SC Santa Maria. The island's main stadium is Estádio Marcelo Leitão situated southeast of Espargos's center and all regional matches are played. Also Basketball is the second most popular on the island as well as volleyball, they are played at Polidesportivo do Sal, Académico do Sal is the island's best basketball team. Futsal is also played. Also dominant particularly in the beaches the south of the island and its surrounding waters are surfing, windsurfing and kitesurfing, recently gained for about 25 years and becoming the most dominant in the nation in windsurfing and kitesurfing. ^ a b c Ray Almeida. "A History of Ilha do Sal". Archived from the original on 6 February 2016. ^ "Klimatafel von Santa Maria / Sal (Int.Flugh.) / Kapverden (Rep. Kap Verde)" (PDF). Baseline climate means (1961-1990) from stations all over the world (in German). Deutscher Wetterdienst. Retrieved 6 November 2018. ^ "INE Estatísticas do Turismo 2017" (PDF) (in Portuguese). 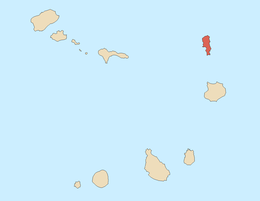 Wikimedia Commons has media related to Sal (Cape Verde). This page was last edited on 10 December 2018, at 18:52 (UTC).